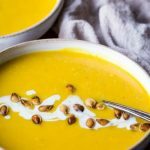 This is a fabulous recipe to make with sugar pumpkin and it's Paleo and Whole30 and so healthy with the addition of turmeric! Cook your pumpkin in your Instant Pot for 15 minutes and one cup of water, then quick release. If you need more details please read this post showing how to cook Pressure Cooker Pumpkin. Turn on the sauce function in your pressure cooker and add the chopped onion to the inner pot of your pressure cooker and saute in a little olive oil. Add the garlic, ginger, turmeric, cumin, salt and pepper to the onions and stir well. Add the chicken broth, coconut milk, and cooked fresh pumpkin to the pot and stir again. Lock the lid, turn the steam release vent to 'sealing' and using the manual setting, adjust it to cook for 5 minutes at High Pressure. When the cook time time is up, allow the unit to reduce pressure on its own without opening the steam release vent (Natural Release) for 7-10 minutes, then release the remaining pressure and open the lid. Using and immersion blender, blend up the pumpkin soup until it is smooth. Taste and adjust seasoning if necessary. Serve hot with a drizzle of coconut milk and toasted pumpkin seeds.